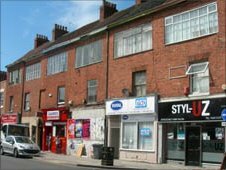 On the east edge of Coventry City Centre, Far Gosford Street has 14 listed buildings and is one of the city's only surviving historic streets. Escaping bomb damage and development, the medieval street layout and many buildings have been preserved. Businesses on the street were very successful in the 1950s, when the rest of the city centre was being rebuilt after the destruction of WW2. However, after decades of decline, Coventry City Council earmarked the street for major redevelopment. In 1992 Far Gosford Street was declared a Conservation Area, containing 30 listed buildings in the designated area, in addition to other structures the council has noted as being historically significant. These are particularly important as examples of how many buildings looked in Coventry's preserved medieval streets before redevelopment. 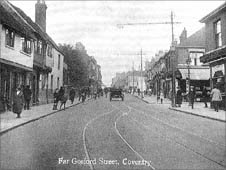 Writing on his Historic Coventry website Rob Orland notes that Coventry once boasted a number of similar streets: "In the 1930s Butcher Row and surrounding streets were razed to make way for Trinity Street. "That alone deprived the city of dozens of Medieval and Tudor aged houses and shops, and for some, a whole way of life." Recent research has uncovered even more information about the street's history, finding records of ownership and business use as far back at the 1530s. These documents show that much of the street was originally owned by medieval monasteries until their dissolution in the 16th century. 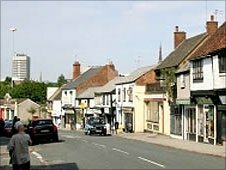 The properties were confiscated and sold, starting a mixed pattern of private and Coventry Corporation ownership. It is also a commonly held belief that Mary Queen of Scots walked down Far Gosford Street, accompanied on her way to incarceration at the guildhall, almost 500 years ago. 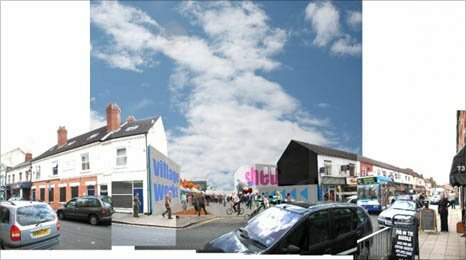 Regeneration plans started in 2005, with the Heritage Lottery Fund and Coventry City Council creating the Townscape Heritage Initiative. The plans subsequently attracted funding from Advantage West Midlands and the European Regional Development Fund. In August 2010, the developer Brian Harrabin talked to BBC Coventry & Warwickshire's Fran Daly about the plans. You can hear their discussion about the £12million project, by following this link: Far Gosford Street interview . The Far Gosford Street project website asserts: "By 2012 the appearance and economy of the street should have improved significantly."